You all must have heard that to make a website visible on World Wide Web it is necessary to host it. Thus hosting helps an organization or business to make their website reachable via the World Wide Web. It basically provides the space, technology, and services that would be needed for your website to be reachable. There are three main types of web hosting viz. Shared hosting, VPS hosting, and Dedicated hosting. All three have different characteristics and have their own advantages and disadvantages. 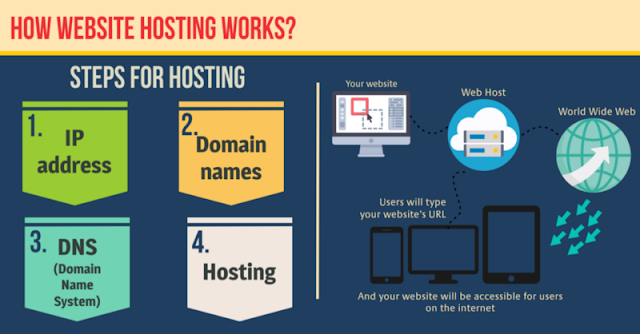 There are terms related to hosting a website like a web server, HTML, CSS, domain, IP address etc. your browser sends a request for the page to the server by connecting through an IP address. When the domain name is translated, you obtain an IP address. The web pages are made up of a computer language called HTML (Hypertext Markup Language) that narrates the format, content, and layout of the page with the help of CSS that is a stylesheet. The web servers then deliver the page through the internet by reacting to the browser’s request. Therefore, in order to host your website on the web server, you need a hosting provider. It is a very simple procedure, but it might get confusing for people who are doing it or the first time. Have you ever thought of how this process of hosting works? Let us go through the steps to host your website. An IP address is a numerical identity with numbers ranging from 1 to 255 and divided by periods. For e.g. the IP address of our website is 103.247.99.254. Each website has its own unique identity and right now there are around 4.2 billion numerical identities. The IP address is essential because there are many computers on the same location that is called LAN (Local Area Network) and many LANs are connected together that is called WAN (Wide Area Network), therefore, each should have a unique identity. When you sign up for a hosting service, you get an IP address. Sometimes one IP address is shared by many and it is also cheaper in price but this can prove to be harmful to the security of your site and it could be penalized or blocked. Having your own dedicated IP address is safe but expensive. Making IP address the identity of your website is not very convenient, this is where domain name comes in the picture. Domain names are considered as the second name for IP address. It is difficult to remember these number and domain names are simpler to remember and understand. It is important to get a domain name for the website and acts as an address. For e.g. want2host. I am sure it is easy for you also to remember want2host rather than 103.247.99.254. One needs to purchase a domain name and it ranges from being cheap to expensive depending on your need. You can book your domain name from 1 to 10 years or so. Before its expiry, make sure, you restore it again or else your domain name will be publicly available. DNS stands for Domain Name Server or Domain Name System. This step is known to be the hardest of all. It basically keeps a record of the information and is in charge of it i.e. Your IP address and domain name. Many times the hosting company itself maintains the information but there are many companies who solely provide DNS services. It gives an affirmation that the domain name is related to the IP address of the computer that has the website hosted on. It is a way for the domain names to guide us to the right computer. Now that you know what IP address, domain names and DNS plays a role, let us look at the last step that is hosting. Now that you have your IP address, the domain name in place it is time to host it and make it reachable. In simple words, hosting is when you pay a company to put your website files on their web server. Your website’s files consist of HTML files, images, videos, photos, etc. To put it all in place, when your domain name is put on the web browser, the DNS is connect it to the right computer/server and then that particular computer has your website hosted on it.